It is strange how things work out. 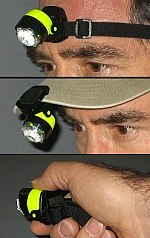 I've just been looking at adding a headlamp to my gear...and here is an ideal one! And the price?? Unbelievable! I was scared to look at the price, then amazed when I saw how low it was! Another DR to add to my collection! Great little light... I wonder, does Aeromedix ship to Canada without too much of a hassle? I'd like to order one. Yes, they ship to Canada. Not sure what might be considered "too much hassle," considering the relatively low cost and size of the light. But, send them an email and they'll get back to you promptly. For some reason the stroller manufacturers were aghast at a baby stroller design that incorporated "baby's first knife" and "baby's first multi-tool." Naaaaa. You can easily buy a "Baby Glock!" (Glock 26). So knives and multi-tools should not be much of a problem after that. Sadly the cost of shipping to the U.K makes buying one impractical. Unless Aeromedix is going to let Outdoor Code have a few? This is mine. Just like doug i wanted it to be found more easily when dropped. I added two piece of reflective tape on mine. Would this light be acceptable for search and rescue work or is it more for emergency or just around camp type use? Thanks.